Refereed/ Peer Reviewed International Environment Journal | Agriculture Journal | Biotechnology Journal. 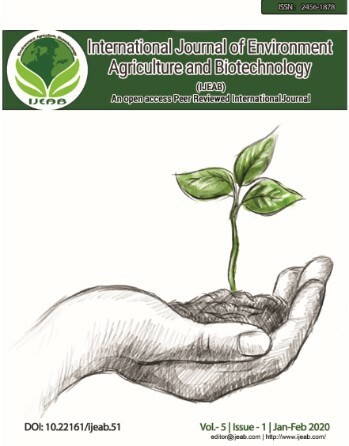 International Journal of Environment, Agriculture and Biotechnology (IJEAB)(ISSN: 2456-1878) is an international open access peer reviewed online journal in the field of Environment , Agriculture and Biotechnology. It’s main aim is to give quality research papers. It covers all sub-fields of above mentioned fields. It provides platform to academicians, students and professionals. It publishes only original research papers and review papers. Submitted paper should meet some criteria like, It should be original, unpublished and not submitted to any other journal. IJEAB is a refereed / Peer Reviewed International Journal. It has high impact from an reputed society and DOI (Digital Object Identifier) from CrossRef. Environment Research Paper Topics: Researches in the field of environmental science such as Aquatic Sciences, Energy Resources and Conservation, Environmental Chemistry, Environmental Biology, Environmental Economics, Environmental Engineering, Environmental Physics,Pharmaceuticals in the environment, Environmental Health - Public Health, Environmental Law - Policy - Eco Justice,Risk assessment, Environmental Management, Environmental Toxicology, Global Change, Climate Change, Monitoring, Environmental Analysis - Monitoring, Nature Conservation - Biodiversity, Pollution and Remediation, Soil Science, Sustainable Development. Milk Production (Dairy):Dairy goat, Dairy cow,Dairy Sheep, Water Buffalo,Moose milk, Dairy product. Biotechnology Research Paper Topics: Researches in the field of biological science such as Animal Sciences, Botany, Bio Chemistry, Biotechnology, Bioinformatics, Cell biology, biochemical ,biogas production, Cryobiology, Ecology, Ethno-biology, Food technology, Forestry Sciences, Fishery Sciences,Fish farm, Shrimp farm, Forensic Sciences, Genetic Engineering, Home Sciences, Life Sciences, Molecular Biology, Microbiology, Medical Sciences, Nanotechnology, Pathology, Pharmaceutical Sciences, Toxicology, Veterinary Sciences, Zoology etc.